This year we are 10 years old ! 90% of our bookings have stayed with us before ……. Our holiday cottages are only a few minutes easy walk from shops, beach & restaurants – an ideal choice for a relaxing break! 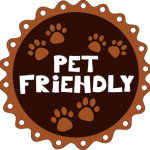 We are pet friendly ! we normally accept up to 4 dogs ( please check with us first for large breeds ) PETS STAY FREE ! Only 2 of you ? let us know and we will adjust our tariff. At Flint & White Cottages pets come free!! Leaving on a Sunday? Relax and take your time – we can offer a delayed departure time up to 4pm ! Booking ahead? Flint and White Cottage are especially popular for the peak summer months – up to end of October we will reserve summer weeks for the following year for a deposit of only £100 per week ( £50 pw if you have stayed with us before), and pay the next deposit by 31st December. Check our calendars for availability – always up to date. With the exception of peak summer weeks we try to be as flexible as possible with start days – so email us with your requirements, we will fit in with you wherever possible. Return the completed booking form with the requested deposit payment, this can be made by cheque, or bank transfer – we give you our UK high street bank account details in the documentation so you know exactly where your money is going. You do not pay us anything until you have received the booking forms in the post to your home address. We are the owners and you deal solely with us – if you have any concerns or queries please feel free to ring our home number anytime 8am – 10 pm (there is an answerphone if we are unable to receive the call). Our main contact number for quick response from Max Flint is our mobile: 07966 398245. FOLLOWING EMAIL CONFIRMATION WE WILL ALWAYS CONFIRM YOUR BOOKING IN WRITING.